i had reported the passing granny, Dai in family name, in my previous twitter. yesterday her funeral held by her offspring. granny Dai is the wife of an zhu, who passed earlier than her many years without any child, in the village. she is a short and a bit fat woman, generally hospitable. she and her husband adopted a girl, who married her neighbor in the village, 3th son of a family with 3 sons and a daughter. so all the offspring of her son-in-law and his relatives joined the funeral and mourning as her sons. its in a long time my first time to witness a village funeral, and many moments in the process when i shot photos and videos for the event i preview the funeral of my past dad, whose funeral i missed and never assured all went right. i many times felt would cry but my camera let me engaged. its also likely my first performance in front of my countryside patriots since my falling into madness several years ago, after so many years they seeing me as the gifted and looked up in expectation of achievement, for i was enrolled by a prodigious university, Nankai Univ., in China, first in the history of zhudajiu, my hometown village. nowadays i really in broad view of my world, and devoted to lead God's glory and sovereign on the land, as well as the nation in my coming kingdom of 1109 years. in the days since my return to the village, i really felt my Royal was inspired by the world that belongs to me, not all the folks in the village, for i perceived so many evil eyes and souls in the village, esp. the blood connected pals, who shown lots of hatred toward my past dad and my old family. God surely let anyone has his goal and pleasure of self-realization independently, but leader like my past dad, should not be hated for his brilliance. only ill hearts and hatreds-filled persons can do. i really saw in these days that God's glory is the kind that its perfection never seen before on the earth, its just too perfect to leave any dent of trifle or meaningfulless among men. it lasts every moments and flashs like beam of light, flows across like breeze in a pulse. half of yesterday was in rain. it started soon after the coffin left the square of the village and after i sorted photos and videos just shot in front yard of my past dad's house, via my notebook and camera. it just so auspicious for me, for i love rain, love baptism, love seeing Masheng rest herself and girl lü in duty in the Sun's setting. i love the constrain rain brings to too bustle persons and ceases to enjoy the superpower of the nature. some women watched my photos, then all cooking utilities moved to my dad's old house, and since them lots of villages busy in the house, cooking, arranging, or watching my works on tv or web in my bedroom. its a nice day, the daughter-in-law of my elder brother brought her webcam to me and i succeeded to install it. 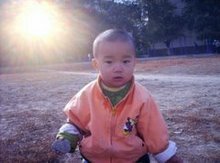 my baby still in these days loathed to talk with me, but i felt i can have more chance to talk with him and his mother online. ok, below is my works for the funeral, which also reminded me one of my teacher, Daijun (in same family name of the past granny), whose fond on me envied by my alumni including those scores in subjects higher than mine and generally more important in class ( they told me later when i in college, while i never felt the fond when i cramming myself for college entrance exam and in depression), in my senior middle school, Huanggang Middle School. Ps: shits! the China surveillance now blocked blogger.com and all my blogspot blogs. i had problem to post my album in flash and 4 videos. what they wan to hell do?